Patios, porches and poolsides can feel lifeless and bare without a touch of greenery. Gardening with potted plants is a simple way to increase the liveliness of an outdoor space where regular gardening isn't possible. Not all gardeners have time to tend to each individual potted plant on a daily basis, but luckily there are plenty of drought tolerant plants that will thrive in pots. A member of the purslane family, moss rose (Portulaca grandiflora), sometimes called sun plant, is a flowering annual native to Argentina, Brazil and Uruguay. The plant boasts a low, trailing habit, with semi succulent green leaves and small, colorful rose-like flowers in a range of colors. The plant thrives in full sunlight and will do well in a pot or container in USDA zones 5 to 11. Moss rose is quite drought tolerant, though it should be watered occasionally to promote healthy flowering. The plant requires a well-drained, sandy soil. Moss rose is somewhat susceptible to aphids, which can usually be washed off with a direct stream of water. Crimson bottlebrush (Callistemon citrinus), also called lemon bottlebrush, is a flowering shrub native to Australia. The plant is densely covered in a green foliage and accented by strange, wiry red flowers which appear in the spring and summer. Crimson bottlebrush will do well in a large pot placed in partial or full shade on a porch or patio. The plant will do best if cultivated in USDA zones 8B to 11A. Crimson bottlebrush is drought tolerant and requires a very well-drained soil, though the shrub is not particular about soil pH. 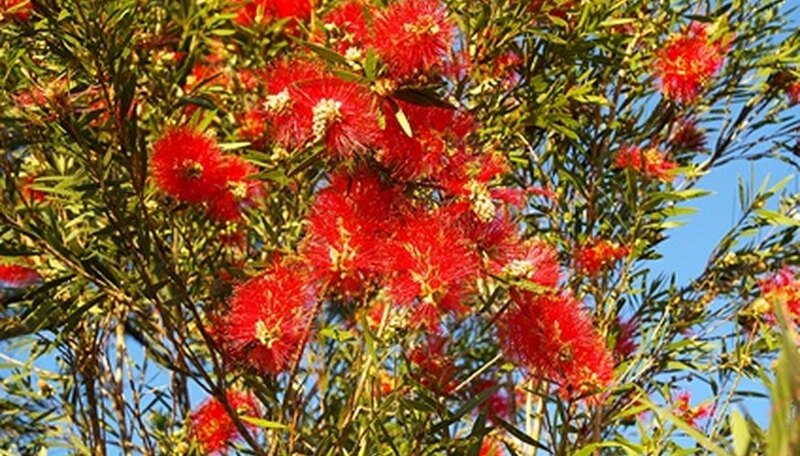 Crimson bottlebrush is a good plant for those hoping to attract birds and butterflies to the garden. Sea lavender (Limonium sinuatum), also called statice, is a small, flowering perennial that only grows to be about a foot and a half tall, if that. The plant boasts thin stems topped with small round flowers in shades ranging from pink to red, purple, lavender and white. The plant has distinct, wiry looking foliage. The summer blooming plant is popular in coastal gardens, as it can survive in somewhat salty soil. Sea lavender does best in full sunlight in USDA zones 9B to 11A. The plant is adaptable to a number of different soil types, from acidic to alkaline or neutral, so long as the soil is well draining. Sea lavender is drought tolerant and supplemental watering is not usually required. The plant makes an excellent potted plant for a sunny location.